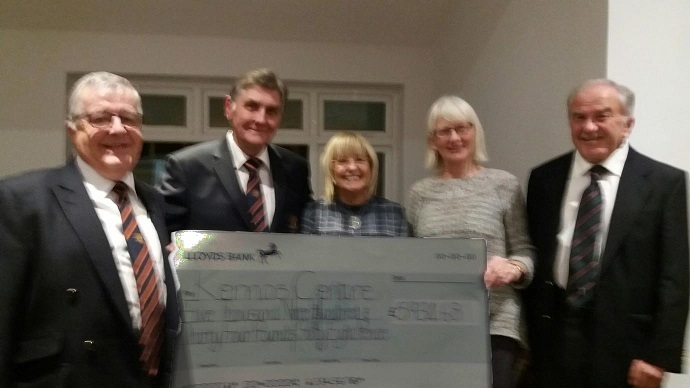 Kernos is extremely pleased to be able to announce that its 2016/17 partnership with Newton Green Golf Club has resulted in over £6000 being raised for the Centre. The partnership, launched on Monday 7th March 2016, saw the Club sponsor various fund-raising initiatives on behalf of Kernos during the recently-retired Captains’ 12-month period of office. Chris Boatwright, Clinical Director of Kernos, said: “On behalf of Kernos I would like to express our deepest thanks to Newton Green Golf Club for their donation of a fantastic £6,084.68. We would particularly like to thank all club members and especially the recently-retired Joint Captains, Rex Thake (Old & Bold Captain) and Ben Tawell (Club Manager) who all helped organise the fund-raising events that resulted in this extremely generous gesture”. 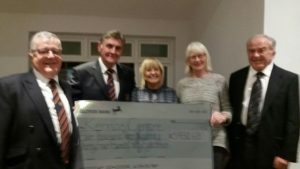 The picture shows (from the left) John Ford (Seniors Captain) and Lee Prentice (recently-retired Men’s Captain) together with (from the right) Geoff Kistner (Seniors’ Captain) and Sally Cade (recently-retired Women’s Captain) making the cheque presentation to Chris Boatwright (Kernos Centre Clinical Director – middle). This magnificent donation will help towards providing the financial support that is constantly needed to ensure that the Centre’s work of providing a professional counselling service to anyone in need, young or old – and in particular those not provided for by current statutory provision – can continue.